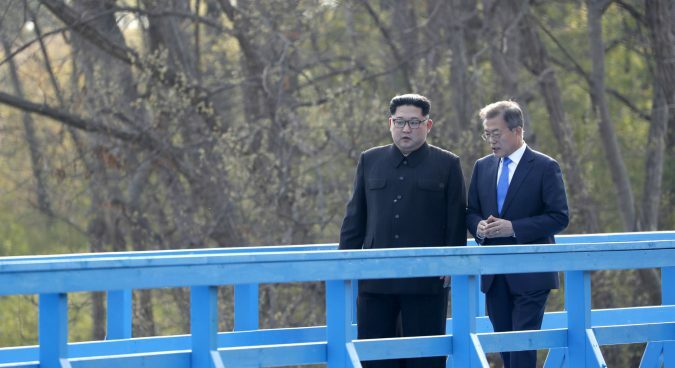 South Korean President Moon Jae-in on Tuesday urged the U.S. and North Korean leaders to make a “bold decision” to make progress in now-stalled nuclear talks, pledging to make a “decisive opportunity” at the upcoming inter-Korean summit. 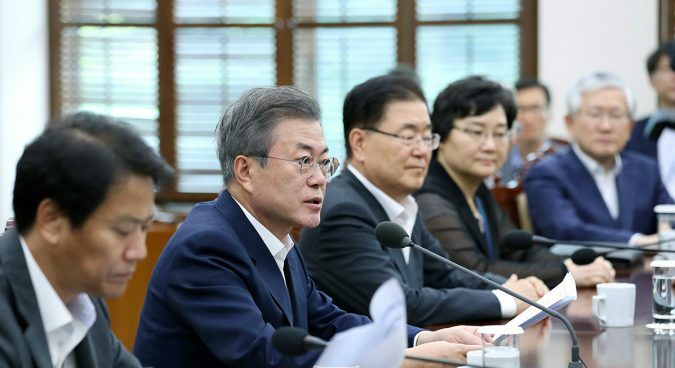 Speaking at the Cabinet meeting, Moon said the “complete denuclearization on the Korean peninsula” is the issue that must be resolved through bilateral negotiations between Washington and Pyongyang. “But we can’t help with making efforts to mediate and promote [talks] as mediator until the North and the U.S. smooth out their dialogue and communications,” he told his key aides. Moon said U.S. President Donald Trump and North Korean leader Kim Jong Un also have requested that South Korea play the role of mediator. In a phone conversation last week ahead of the visit to the North by the South Korean presidential special delegation, Trump reportedly asked Moon to “play the role of chief negotiator” representing both Pyongyang and Washington. After the delegation’s visit, South Korean director of the presidential National Security Office (NSO) Chung Eui-yong conveyed Kim Jong Un’s message to Washington during a phone call with National Security Adviser John Bolton last Thursday. “A plan with a broad-minded approach and bold decision between the North Korean and U.S. leaders is needed once again to step towards an advanced stage,” Moon said, adding the advanced stage is where Pyongyang “discards nuclear weapons currently possessed” by the regime. The South Korean President also said he will “concentrate on efforts to ease military tensions and hostile relations between the two Koreas and the U.S.” at his third meeting with Kim Jong Un, which is scheduled to be held between September 18 and 20 in Pyongyang. “Then, we can push forward with inter-Korean economic cooperation and the new map of the Korean peninsula,” he continued, referring to the “New Economic Map” Initiative – one of the major policy tasks of the Moon administration to see the economic unification of the Korean peninsula. Moon also emphasized that Seoul should seek an opportunity to break the deadlock on U.S.-DPRK relations at the fifth inter-Korean summit. This week’s major celebrations in Pyongyang, including a military parade, were closely watched for signs of extended deadlock, but President Trump’s positive reaction – citing the lack of ICBMs in the parade despite the presence of anti-American slogans – may lead to a reboot of the process. Reaffirming the shift, White House press secretary Sarah Sanders said Monday that Kim Jong Un had requested a second summit between him and Trump, and that the two sides were “already in the process of coordinating” it. 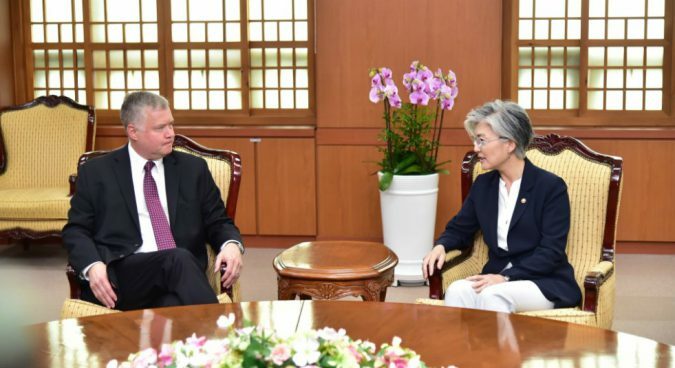 U.S. State Department special representative for North Korean affairs Stephen Biegun arrived in Seoul Monday to begin a scheduled trip to meet with allies in the region on these issues. 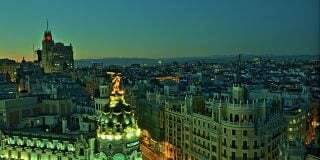 He met with South Korean foreign minister Kang Kyung-wha on Tuesday morning as well as the country’s chief nuclear negotiator Lee Do-hoon. During the talks with Kang, the two sides discussed progress in North-South relations and the results of a visit to Pyongyang last week by a team of South Korean special envoys, the South Korean Ministry of Foreign Affairs (MOFA) said in a statement. Kang congratulated Biegun on his recent appointment and requested he play an “active role in achieving the complete denuclearization and peace settlement on the Korean peninsula as agreed to by the U.S. and both Koreas,” the statement continued. Biegun reportedly agreed to fulfill this role and vowed to continue close consultations at multiple levels between the U.S. and South Korea towards the goal of peace and denuclearization on the peninsula. Both Kang and Biegun stressed the importance of the U.S.-ROK alliance amid ongoing negotiations, especially ahead of the inter-Korean summit in Pyongyang next week and Kang’s visit to the UN General Assembly kicking off in New York shortly after. MOFA released a similar statement Tuesday afternoon following Biegun’s meeting with Lee, saying the two agreed that “frequent close coordination is the most important thing” ahead of these events. While Biegun did not answer questions from reporters following talks with both Kang and Lee, he did strike an upbeat tone in brief remarks Tuesday, calling the moment a “tremendous opportunity” and just “the beginning” of further discussions on the matter, Yonhap News Agency reported. Biegun’s appointment to the position was announced in late August by Secretary of State Mike Pompeo, who also announced in the same briefing the two would embark for Pyongyang the following week. Colin Zwirko and Dagyum Ji are NK News correspondents based in Seoul, South Korea.